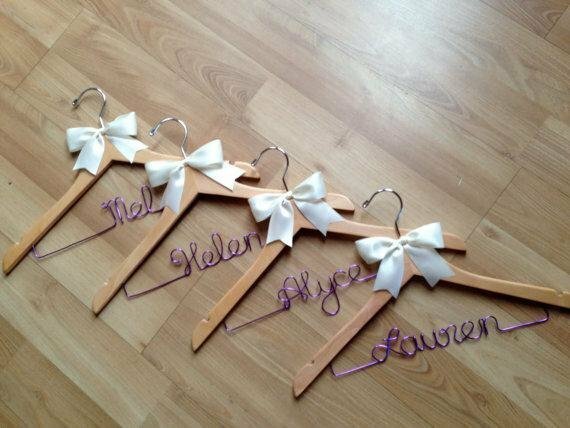 Stunning personalised wedding coat hanger decorated with large satin bow - the perfect gift for your bridal party. This hanger is finished off with a lilac coloured wire, perfect for purple themed weddings. Hangers are not only a great gift, but they also look great when displaying your wedding dress or bridesmaid dresses in photos. Picture shows: Natural wood hanger with ivory bow & lavender wire. Nicole, The bridesmaids loved their coat hanger gifts, such a unique & cute idea. Thanks for your prompt & professional service.